Setting configuration bits in dsPIC/PIC24 can be done with the help of the utility given in MPLAB X which will make our life a lot easier. Hope this post will help on how to bring in the configuration bits window (configuration window). 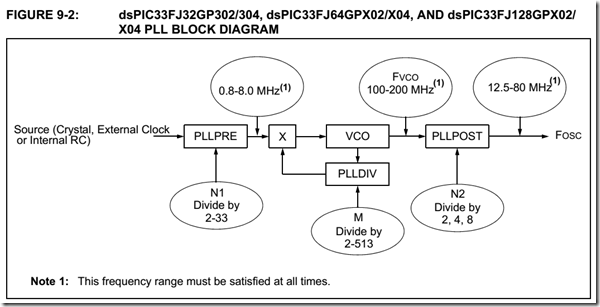 Setting configuration bits in PIC24 is much similar to PIC18 but for dsPIC we need to do some reading. The last 2 items in the list above are pretty much the same, but still gives a good idea. As mentioned above, setting PIC24 configuration bits are much similar to PIC18 but not the same. I am using dsPIC33FJ128GP202. Getting into the config_docs folder (%XC16 install folder%\docs\config_docs) there will be html pages containing the configuration bit name and comments in their respective device page. Please read it for the device that you will be using. 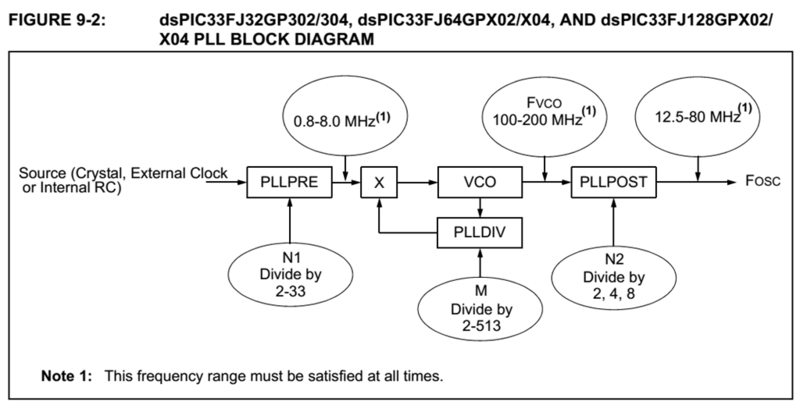 In 8-bit PIC’s the operating frequency Fcy = Fosc/4. But in 16-bit PIC’s (dsPIC and PIC24) Fcy = Fosc/2. But there are more than just that. To set the Fosc it is depended on what you have in configuration bits, PLL and more (which I’ll let you know below) I will show only the changes I made in the configuration bits related to clock settings. Definitions of those names can be found in the html page in config_docs folder. IESO bit is turned on and if you read the datasheet you’ll know why. I am suing 20MHz crystal oscillator (that’s what I was able to find around quick). Right now I have 20MHz crystal. So lets see how I’m going to set it up to get 80MHz off of it. N1 and N2 does division. which will become our Fosc = 80MHz. So create a function called SetupClock() and this is how the settings will be set.